upstart: Sanjay Parekh 06MBA started his own company, Digital Envoy, and wants to help others do the same. The obstacles facing fledgling businesses are daunting: they need investors, angel funding, or partnerships with larger companies to get off the ground. 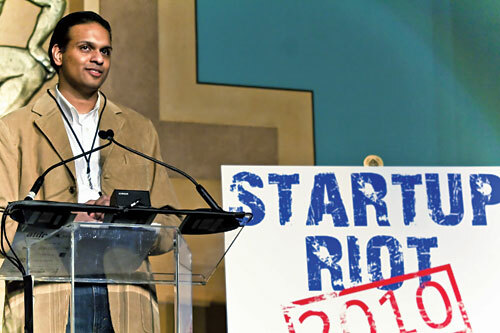 But Atlanta’s third-annual Startup Riot, founded by Sanjay Parekh 06MBA, aims to help entrepreneurs with startups make connections and build awareness about their ventures. This year’s Startup Riot attracted more than four hundred observers and gave fifty hopefuls the opportunity to present three-minute pitches. As on ABC’s popular reality television show Shark Tank, real-life investors can choose to bite—or not. Parekh selects those who get to present, and they’re typically technology- and Internet-related. “I’m looking for an interesting business that is scalable,” he says. For now, Parekh has no plans to expand the Riot into other cities, preferring to focus on local entrepreneurship, one hopeful pitch at a time.